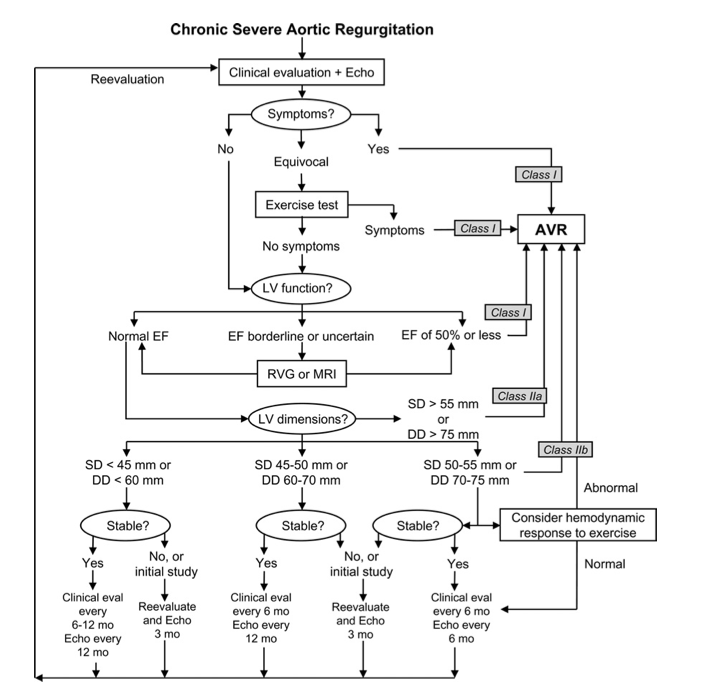 (1) Echocardiography is indicated to confirm the presence and severity of acute or chronic AR. (2) Echocardiography is indicated for diagnosis and assessment of the cause of chronic AR (including valve morphology and aortic root size and morphology) and for assessment of LV hypertrophy, dimension (or volume), and systolic function. (3) Echocardiography is indicated in patients with an enlarged aortic root to assess regurgitation and the severity of aortic dilatation. (4) Echocardiography is indicated for the periodic re-evaluation of LV size and function in asymptomatic patients with severe AR. (5) Radionuclide angiography or magnetic resonance imaging is indicated for the initial and serial assessment of LV volume and function at rest in patients with AR and suboptimal echocardiograms. (6) Echocardiography is indicated to re-evaluate mild, moderate, or severe AR in patients with new or changing symptoms. (1) Exercise stress testing for chronic AR is reasonable for assessment of functional capacity and symptomatic response in patients with a history of equivocal symptoms. (2) Exercise stress testing for patients with chronic AR is reasonable for the evaluation of symptoms and functional capacity before participation in athletic activities. (3) Magnetic resonance imaging is reasonable for the estimation of AR severity in patients with unsatisfactory echocardiograms. (1) Exercise stress testing in patients with radionuclide angiography may be considered for assessment of LV function in asymptomatic or symptomatic patients with chronic AR. (1) Vasodilator therapy is indicated for chronic therapy in patients with severe AR who have symptoms or LV dysfunction when surgery is not recommended because of additional cardiac or noncardiac factors. (1) Vasodilator therapy is reasonable for short-term therapy to improve the hemodynamic profile of patients with severe heart failure symptoms and severe LV dysfunction before proceeding with AVR. (1) Vasodilator therapy may be considered for long-term therapy in asymptomatic patients with severe AR who have LV dilatation but normal systolic function. (1) Vasodilator therapy is not indicated for long-term therapy in asymptomatic patients with mild to moderate AR and normal LV systolic function. (2) Vasodilator therapy is not indicated for long-term therapy in asymptomatic patients with LV systolic dysfunction who are otherwise candidates for AVR. (3) Vasodilator therapy is not indicated for long-term therapy in symptomatic patients with either normal LV function or mild to moderate LV systolic dysfunction who are otherwise candidates for AVR. (1) Cardiac catheterization with aortic root angiography and measurement of LV pressure is indicated for assessment of severity of regurgitation, LV function, or aortic root size when noninvasive tests are inconclusive or discordant with clinical findings in patients with AR. (2) Coronary angiography is indicated before AVR in patients at risk for CAD. (1) Cardiac catheterization with aortic root angiography and measurement of LV pressure is not indicated for assessment of LV function, aortic root size, or severity of regurgitation before AVR when noninvasive tests are adequate and concordant with clinical findings and coronary angiography is not needed. (2) Cardiac catheterization with aortic root angiography and measurement of LV pressure is not indicated for assessment of LV function and severity of regurgitation in asymptomatic patients when noninvasive tests are adequate. (1) AVR is indicated for symptomatic patients with severe AR irrespective of LV systolic function. (2) AVR is indicated for asymptomatic patients with chronic severe AR and LV systolic dysfunction (ejection fraction 0.50 or less) at rest. (3) AVR is indicated for patients with chronic severe AR while undergoing CABG or surgery on the aorta or other heart valves. (1) AVR is reasonable for asymptomatic patients with severe AR with normal LV systolic function (ejection fraction greater than 0.50) but with severe LV dilatation (end-diastolic dimension greater than 75 mm or end-systolic dimension greater than 55 mm). (1) AVR may be considered in patients with moderate AR while undergoing surgery on the ascending aorta. (2) AVR may be considered in patients with moderate AR while undergoing CABG. (3) AVR may be considered for asymptomatic patients with severe AR and normal LV systolic function at rest (ejection fraction greater than 0.50) when the degree of LV dilatation exceeds an end-diastolic dimension of 70 mm or end-systolic dimension of 50 mm, when there is evidence of progressive LV dilatation, declining exercise tolerance, or abnormal hemodynamic responses to exercise. 1. AVR is not indicated for asymptomatic patients with mild, moderate, or severe AR and normal LV systolic function at rest (ejection fraction greater than 0.50) when degree of dilatation is not moderate or severe (end-diastolic dimension less than 70 mm, end- systolic dimension less than 50 mm).